Chances are you’ve seen a chef or two make those “fancy” chocolate bowls on the Food Network… You know, the ones where you dip an inflated balloon in some melted chocolate? 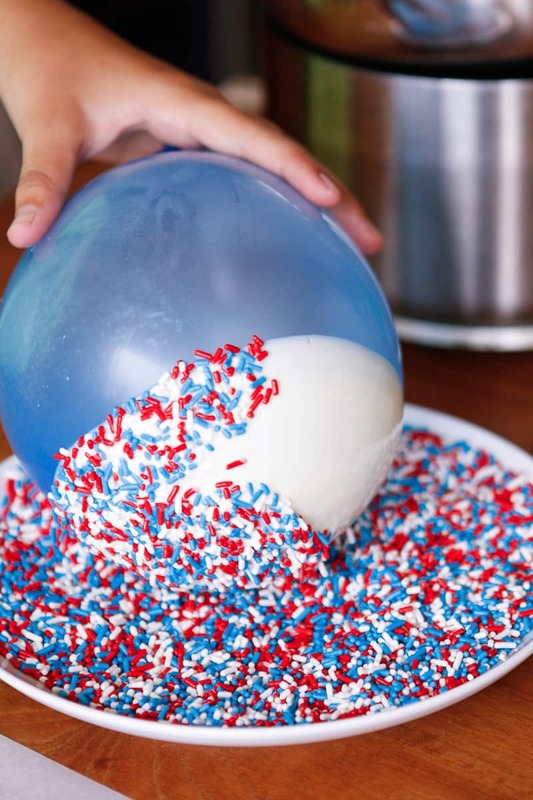 Well, I decided to take it one step further and coat them in sprinkles — red, white and blue sprinkles to be exact. Perfect for the upcoming 4th of July! Truth be told, they’re actually really easy to make. All you need are a pack of white balloons*, a package of Ghirardelli White Chocolate Melting Wafers, and about a cup of sprinkles. I highly recommend the Ghirardelli chocolate if you can find it — it’s by far the best I’ve tried. I picked mine up at Walmart, along with a pack of balloons from the party section. *You’ll notice that I used colored balloons in the photos, but I experienced some issues with the latex sticking to the chocolate with them. I didn’t experience this issue with the white balloons, so my guess is something used to color the balloons caused this problem. Start by melting the white chocolate. I used this DIY double boiler method that I’ve shared in the past. No need to buy task specific equipment when a saucepan and metal bowl will suffice! 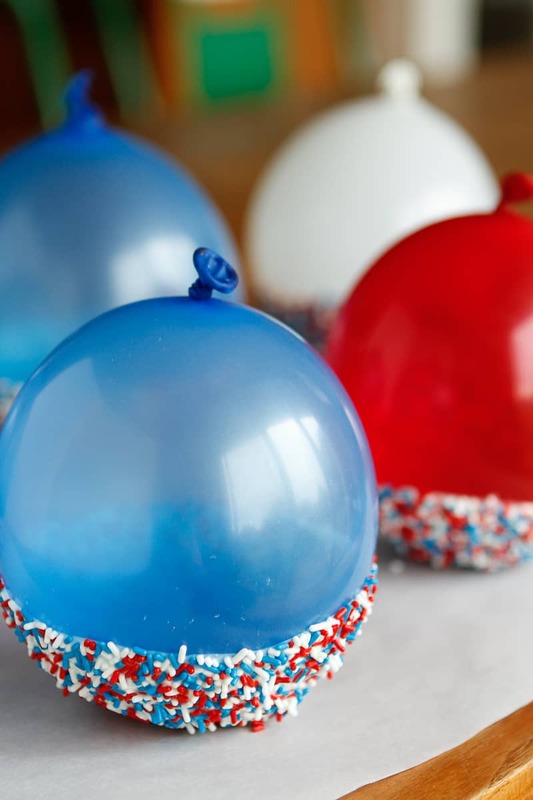 Blow up about six balloons to the size you desire your finished chocolate bowls to be. Dip one of the balloons about a third of the way into the melted white chocolate and rotate it to ensure an even coating. Then pull it straight up out of the chocolate. Don’t worry about scraping any excess white chocolate off of the bottom — I found it serves to create a nice flat base for the bottom of the bowl. Next press the white chocolate-coated balloon straight down into the sprinkles. The lift and press to coat one side, continuing to lift, rotate, and press until all of the chocolate is coated in sprinkles. It’s tempting to roll the balloon around to coat, but this will only smear the white chocolate, creating a sloppy mess. Set the coated balloons on a piece of parchment paper to let the chocolate solidify. Or if you want to speed up the process, place them on a nonstick baking sheet and pop it into the refrigerator for about five minutes. After the chocolate has cooled and set up, cut a small hole in the balloon and gently let the air out, carefully peeling the balloon away from the chocolate bowls. Voila, you’re left with sprinkle-coated chocolate bowls! 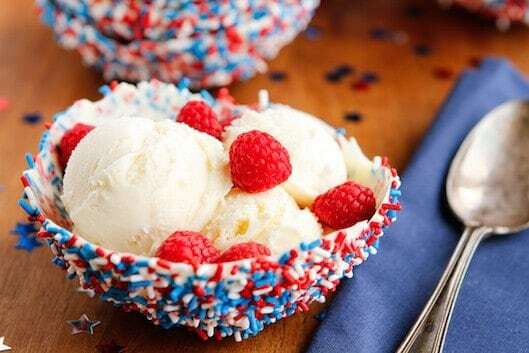 We filled our patriotic chocolate bowls up with our favorite vanilla bean ice cream, and topped that off with some lovely fresh raspberries that I also picked up at Walmart. I think the sprinkles make the chocolate bowls decidedly less dinner party-esque and give them a totally festive vibe. Melt the white chocolate in the microwave or a double boiler. 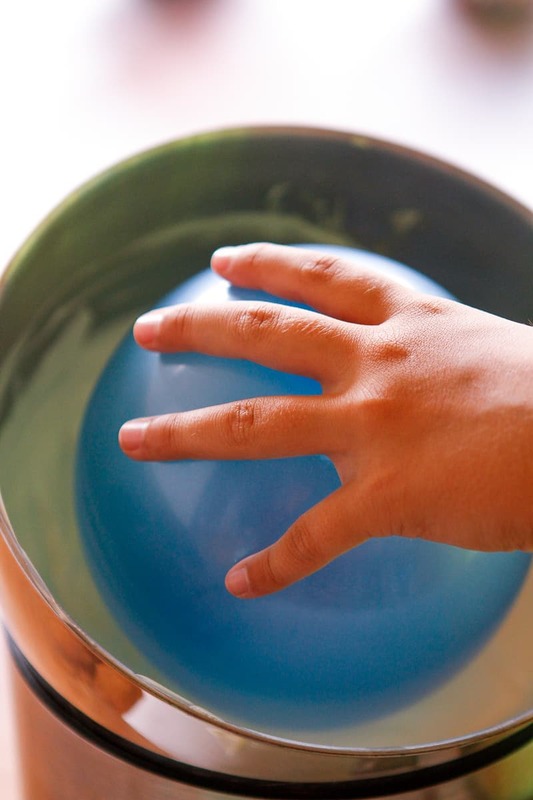 Blow up six balloons to the desired size of your finished bowls. Dip one of the balloons about a third of the way into the melted white chocolate and rotate it to ensure an even coating. Then pull it straight up out of the chocolate. Next press the white chocolate-coated balloon straight down into the sprinkles. The lift and press to coat one side, continuing to lift, rotate, and press until all of the chocolate is coated in sprinkles. Set the coated balloons on a piece of parchment paper to let the chocolate cool, or place them on a nonstick baking sheet and refrigerate for about five minutes. When the chocolate is set, cut a small hole in the balloons and gently let the air out, carefully peeling them away from the chocolate bowls. Fill the finished chocolate bowls with your favorite treats! 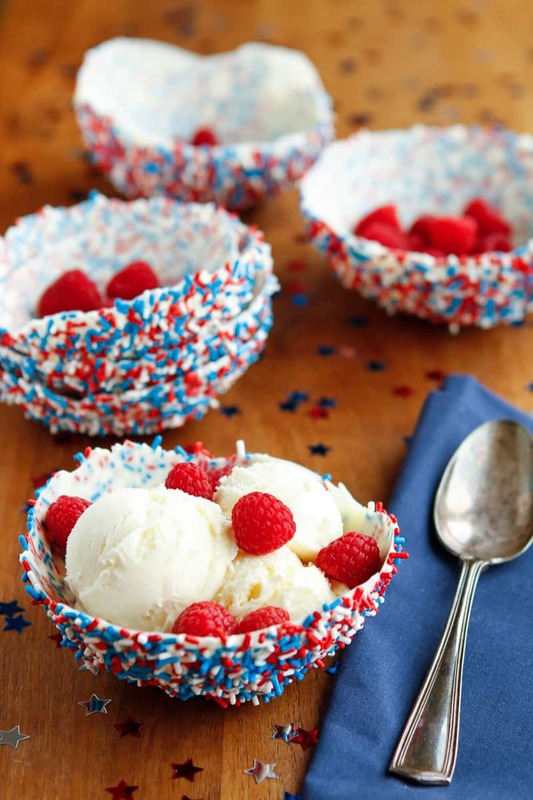 How cute would these bowls be for a birthday party dipped in multi-colored sprinkles? This is the coolest thing ever! I’m definitely going to give these a try!